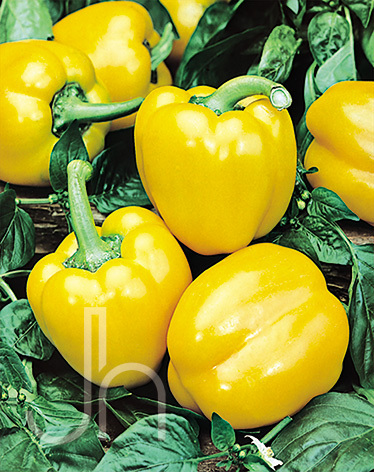 Yellow Bell Peppers are extremely sweet peppers that mature to a yellowy-orange color and have a thick wall. Being sensitive to the cold, planting should be delayed until the danger of frost is past in the spring. Ideal temperatures are 70 to 80 degrees F during the day, and 60 to 70 degrees F at night. Usually, the plants set satisfactory crops when temperatures are between 65 and 80 degrees F and the soil is well-supplied with moisture. Avoid a soggy, water-logged soil condition when growing peppers. Outstanding Features: Tastes great either raw or cooked. Click here to buy Yellow Bell Peppers direct from www.buygardenvegetables.com.